A signed and dated print from an original portrait painting by artist Robert Toth. The modern day Lord Salisbury portrayed by Gary Thornburg is an original oil painting by artist Robert Toth. 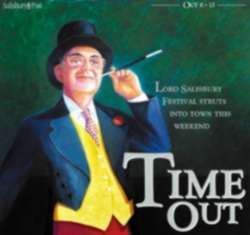 Robert Toth's painting was used on the cover of the Salisbury Post, Time Out Magazine to report the events of the 2005 Lord Salisbury Festival. The mascot and host for the event is, naturally, Lord Salisbury, played by actor Gary Thornburg. Thornburg will be on hand at festival events. Click the Time Out cover on the left to read the article.